I've decided to start a "weekly wishes" post for anyone like me, who spends a lot of time online window shopping and not actually purchasing anything at the end of it as were too skint (or at least I like to think so). This week, I have decided to dedicate the weekly wishes to floral designs. I had quite a lot of fun researching the different floral creations out there and had to pick these as my favourites. Floral Bag: This is very girly and I guess that's why it's called the "Lady Bag". For me, £38 is a little too dear for a bag which I find I could get a replica of at primark. Needless to say, Accessorize has never failed to imrpess me with their never ending commitment to ensuring that all items are of good condition and last! Rose Print Cigarette Trousers: Now this was the main item that caught my eye. I mean, I think it is just genius. To combine a floral print, with a cigarette design which gives a slight ombre effect is just the way to impress. I personally probably would pay the £35 for these but would have no idea on how to wear them or what with. Ditsy Denim Bralet: I believe that every girl should have some sort of bralet as they are becomming popular with most outfits nowadays. This one is simple, denim and has a slight floral print which I love. Again for Topshop, it's a little pricey for such a small item but definitely one for the festivals. Swirl Print Skort: This is my second favourite. After walking past the Norwich store at the weekend, this caught my eye. 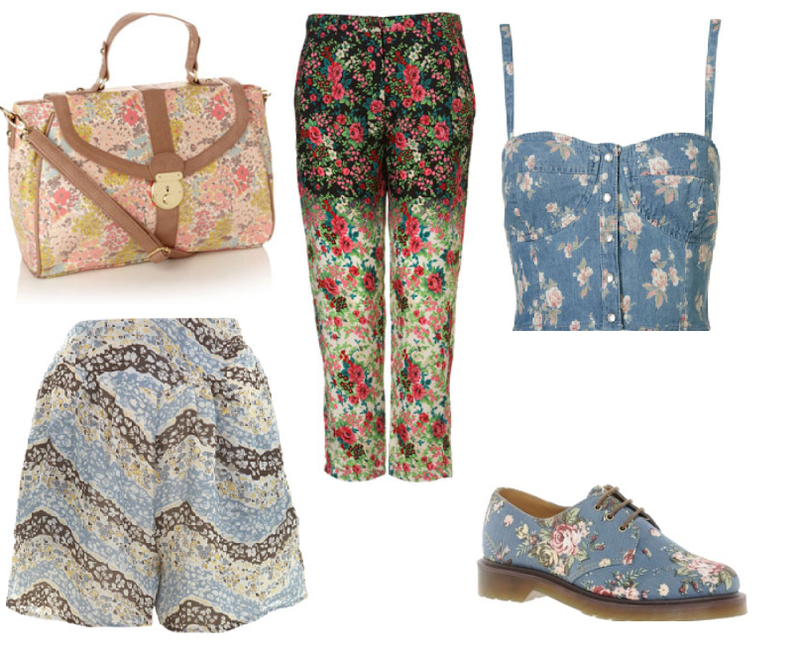 I love the colours and I love how the print is different to any normal floral print. This is definitely something I could see myself wearing. Dr Martins: Now everybody has a crush on Dr Martins eh? These ones are cute and I love the blue shade. These would look perfect with the skort! But again, with that kind of price and my nervousness for spending too much money on one item, I don't think I would buy these. Anyody who has the guts to fork out on footwear like these I really do admire you!